In the following statements, the NOFIT option is specified in the MODEL statement to prevent PROC LOGISTIC from fitting the model with three covariates. Each ROC statement lists one of the covariates, and PROC LOGISTIC then fits the model with that single covariate. Note that the original data set contains six more records with missing values for one of the tests, but PROC LOGISTIC ignores all records with missing values; hence there is a common sample size for each of the three models. 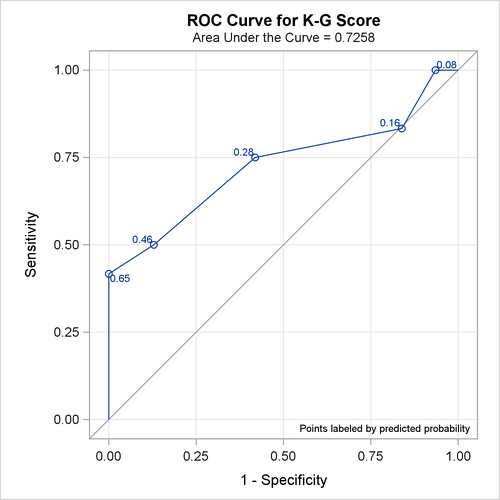 The ROCCONTRAST statement implements the nonparametric approach of DeLong, DeLong, and Clarke-Pearson (1988) to compare the three ROC curves, the REFERENCE option specifies that the K-G Score curve is used as the reference curve in the contrast, the E option displays the contrast coefficients, and the ESTIMATE option computes and tests each comparison. With ODS Graphics enabled, the plots=roc(id=prob) specification in the PROC LOGISTIC statement displays several plots, and the plots of individual ROC curves have certain points labeled with their predicted probabilities. The initial model information is displayed in Output 60.8.1. For each ROC model, the model fitting details in Outputs Output 60.8.2, Output 60.8.4, and Output 60.8.6 can be suppressed with the ROCOPTIONS(NODETAILS) option; however, the convergence status is always displayed. The ROC curves for the three models are displayed in Outputs Output 60.8.3, Output 60.8.5, and Output 60.8.7. 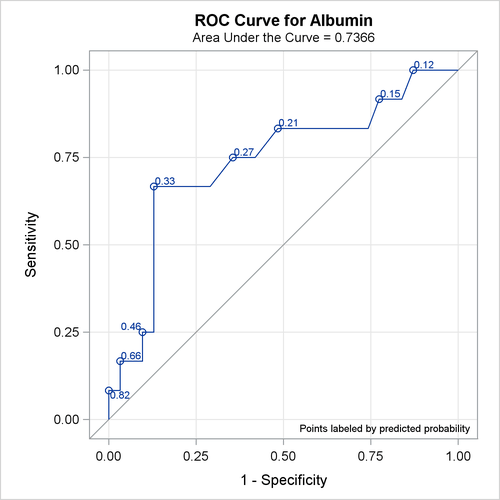 Note that the labels on the ROC curve are produced by specifying the ID=PROB option, and are the predicted probabilities for the cutpoints. All ROC curves being compared are also overlaid on the same plot, as shown in Output 60.8.8. 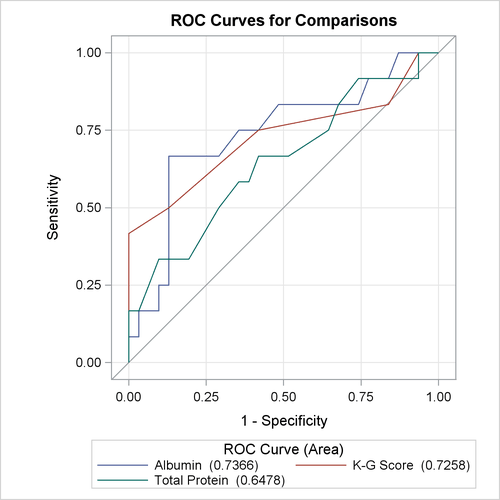 Output 60.8.9 displays the association statistics, and displays the area under the ROC curve along with its standard error and a confidence interval for each model in the comparison. 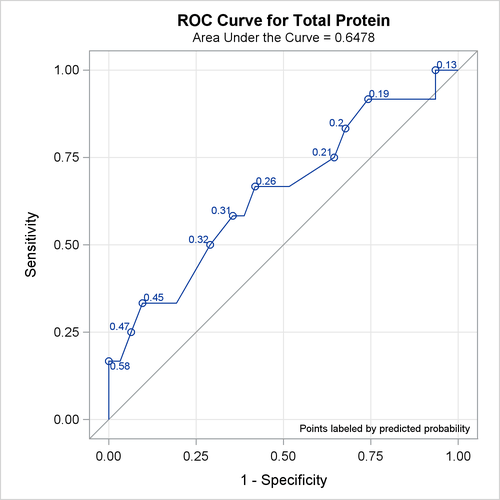 The confidence interval for Total Protein contains 0.50; hence it is not significantly different from random guessing, which is represented by the diagonal line in the preceding ROC plots. Output 60.8.10 shows that the contrast used ’K-G Score’ as the reference level. This table is produced by specifying the E option in the ROCCONTRAST statement. Output 60.8.11 shows that the 2-degrees-of-freedom test that the ’K-G Score’ is different from at least one other test is not significant at the 0.05 level. Output 60.8.12 is produced by specifying the ESTIMATE option in the ROCCONTRAST statement. Each row shows that the curves are not significantly different.